Illicit capital flow from Bangladesh has been one of the crucial issues both in the politics and socio economic sector of Bangladesh. Every year an enormous amount of money is being siphoned off to tax heaven countries illegally. As per latest report-2015 of Global Financial Integrity (GFI) an estimated of US$ 55.88 billion has illicitly been transferred from Bangladesh to foreign countries during the year from 2003 to 2014 which is roughly 1.5 times of the fiscal budget 2015-16 of Bangladesh. 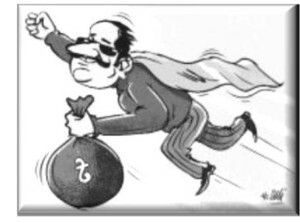 Every ear around US$6 billion has been transferred illicitly to other countries and Bangladesh became the 26th no country in the world in respect of illicit financial flow. The highest illicit financial flow has happened in 2013 which is BDT 776 billion ($9.7 billion) which is 12 times more than the foreign aid and 141% excess of foreign loan of FY2015-16.